Feature Low intermodulation design and optimized return band prevents high cable modem signals from affecting forward band transmission. 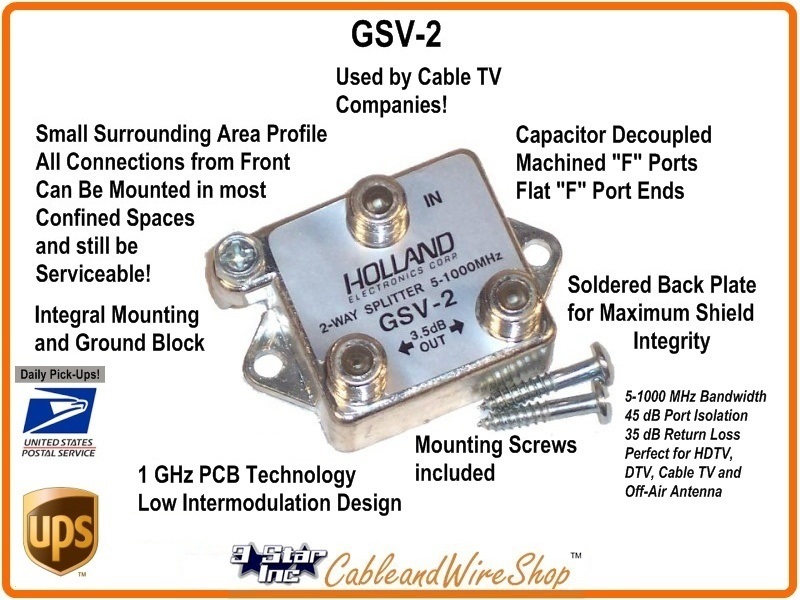 The GSV Series 1 GHz Splitters are state-of-the-art product lines designed and tested using the most current procedures. New performance features have been incorporated to make both series compatible with the latest digital and return path requirements. This is one of those splitters you would find or use inside of those steel lock-boxes on the side of an Apartment complex, or the little gray box on the side of your Home or Office that the Cable TV company installed. It features Vertical Port "F" Connections. Its typically used inside of these little boxes because it's easier to connect/disconnect the cables when all the "F" connection Ports are facing in the same direction. So when you are mounting a 2-way splitter in a tight space without a lot of room around it for the RG-6 Coaxial Cable to make connection, this is the one you want! It will pass Forward and Return signals; making it perfect for Splitting Cable TV with High-Speed Internet Connection Signals. The Voltage Protection also makes it suitable for splitting HD TV Antenna Signals as well. The Flat "F" Connector ends means that the connection to the RG coaxial cable you use (RG-6 or RG-11) is solid, secure and doesn't slip or back off after tightened with appropriate force (most Coaxial Cable Manufacturers specify in inch/pounds). If you are adding a splitter to an existing Cable TV or Antenna feed, you may need to compensate for the loss that you are about to introduce. The gain of a Line Amplifier should be selected to zero out the loss that follows it. In other words, if you have fifty feet of cable and a two-way splitter, then a 10 db amplifier will be fine. Conversely, if you have an eight-way splitter and hundreds of feet of cable, you will need an amplifier with a higher gain. Just as in the case of a Pre-Amplifier, however, bigger is not always better. Commensurate with Coaxial Cable TV Antenna Splitter Installation, you want to Ground your Cable TV or HDTV Antenna Coaxial Cable System Outside before bringing the TV Cable Inside. This way, Lightning Strikes and Power Surges have an opportunity to arrest before reaching your TV and Entertainment Electronics. The Integral Grounding Block designed onto every Outdoor Use Compatible RF Signal Splitter we sell will effectively convey this unwanted Electrical Energy to a Ground Rod via a Copper Ground Wire that you Install (not included). Consult your Local Building Code and NEC for guidance to Properly Grounding your HD TV Antenna, Cable TV, WI-FI, Wireless Internet, Business Band, CB or Amateur Radio Antenna Installation. HOLLAND 2-Way Horz. Splitter 5-1000 MHz. Power Pass -W- Grd.